As you may already know from reading “Traveling With Children On A Long Distance Trip (And Your Best Tips? 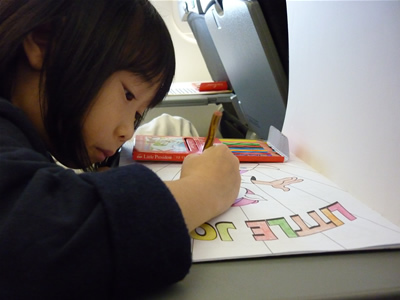 )”, my wife and I with two preschoolers went on an 8-hour flight to Melbourne recently. I was so worried that (because of past experience), I needed some advice on how to help me to get through the long flight with two young children tagging along. We reached home safely May 10th. Let’s see what happened during our trip. On Day 1, the flight to Melbourne was smooth. My two kids were sitting with my wife and she was doing everything she could to keep them occupied. Let me share with you – from our experience – the things you can do if you are traveling with young kids in the future. Bring some wrapped gifts that contain little toys, stationery, food, etc. Don’t bring out all at once. Only give it to your child when he starts to show boredom. Let him unwrap the gifts to increase curiosity. For some reason, children (to some extent adults) love to open gifts. Apart from coloring books, you can also bring some stickers. Bring some tidbits and yes… junk food. Don’t leave home without your child’s favorite snacks. For my children, they love Kit Kat, M&Ms, raisins, lollipops, Mamee, and the list goes on. Let them sleep. 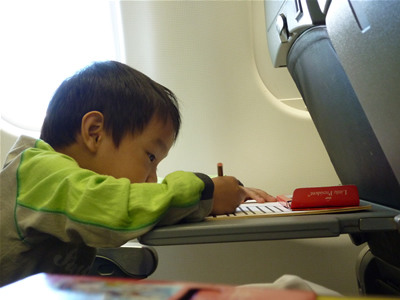 Your child will get tired during a long flight. Encourage them to take a nap. If possible, try to find a row of empty seats so that your child can sleep lying down as this is more comfortable. Appreciate the scenery. If it’s not dark outside, try to teach your child what you can see in the sky while flying through the window. These are the things we can’t see when we are on the ground. The kids will be amazed. These are probably what we did during the flight. We reached Melbourne midnight and we asked the traffic controller (the person who manages the taxi queue) to call for a MaxiCab – which can cater for 6 persons. Phew! What a tiring trip.